Group pledge, which contains 6 x Multiuniversum (main game) and 6 x Project: Cthulhu (Expansion). "Mystery Scrolls" e-postcard with beautiful arts from Multiuniversum Project: Cthulhu. 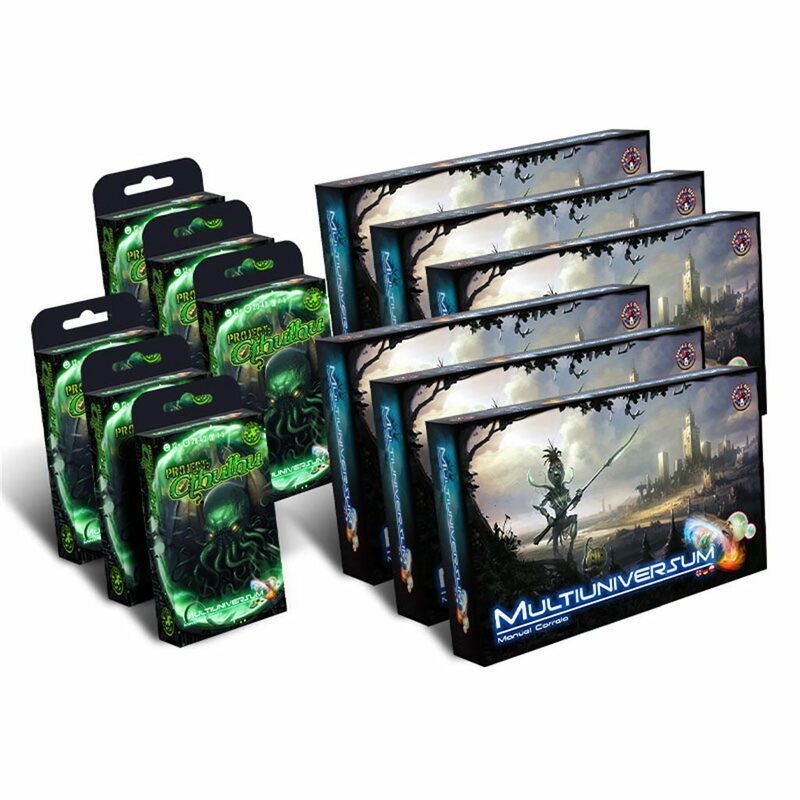 6 x Necronomicon - Multiuniversum Project: Cthulhu expansion with all its contents, including all related unlocked stretch goals + Multiuniversum - main game. This is the whole set (Necronomicon) x 6! Well, some people are simply masters at explaining rules, so we’d like to invite you for the rules explanation of the original Multiuniversum game, with Professor Rahdo. Not enough? Perhaps the written records will suit you better – download rulebook. The stars are right and you know what that means! Yes, our scientists have opened a portal to R'lyeh and bad stuff is coming through. Multiuniversum’s first expansion includes a new set of portals which replace the original ones and bring in new mechanics and risks. Video tutorials are so much better than text descriptions. That said, let professor Bartekintroduce you to Multiuniversum Project: Chtulhu. So what are we changing here? Portals: Every time you close a portal you lose a bit of your sanity, represented by insanity cards. Insanity Cards: These cards are something new and nasty. As you close portals you’ll collect them and they’ll be face down for most of the time. Museum Card: The museum is where the players can get some of their sanity back. You can interact with it to spend some of your insanity cards for various effects. Move: In addition to all the things you could do using action cards, you can also discard one to move to an adjacent transformer. This pledge level nad game wll contain all reached stretch goals!